Like many people, making food is my preferred demonstration of affection. Even more so, I love the challenge of trying to make everything in a meal from scratch, even if it kills me and takes a thousand times longer. It’s one part self-inflicted torture, one part expression of love. So with Mother's Day being this past weekend, I charged full steam into the kitchen. Spending my entire weekend creating a meal that could have easily been churned out in an afternoon got me thinking. My obsession with making everything from scratch is quite the departure from my Grandma’s approach to food. Before I go any further, please note that this reflection comes devoid of judgement and instead with a very large dose of humility. My grandma, a mother of five and housewife during the boom of the boxed food industry, fully embraced everything that Kraft and Betty Crocker had to offer. From boxed mashed potatoes to cake mixes, you name it, she bought it. And why shouldn't she have? It saved time, money, and meant she didn't have to spend every single moment in the kitchen. I realize that as a 31-year old woman with no children, a Google Express account, and a husband who shares the housekeeping chores, I have certain luxuries that my grandma simply did not have. While she was trying to keep a husband and five children clean, healthy and fed, I am trying to remember to feed two cats and not kill some houseplants that NASA says will purify the air. Life is not always easy, but I certainly have time to embrace my yuppie hipster-self and pickle carrots and make almond milk. Understandably, Grandma has never understood my insistence on taking the culinary long route. It’s often a topic of banter- why do I stress about making a cake that could fall flat when our good friend Betty Crocker has a foolproof solution? But because I am stubborn, I always insist on doing it my way. And because that stubbornness was inherited from her, she goes to the store and buys a back-up apple pie, just in case my cake fails. So in honor of Mother’s Day and Grandma, I made her favorite pie, banana cream pie. And because I love her, I made it all from scratch, whipped the whip cream, and caramelized bananas to add some flare. My love is in the labor, even when it seems ridiculous to her. But I did make one concession as a tribute. I used store bought Nilla Wafers for the crust. For the record, I found a recipe to make them by hand, but I had to draw the line somewhere. So here’s to you, Grandma, Happy Mother’s Day. We can eat the apple pie hiding in your freezer next weekend. Ingredients for the pie crust. The Nilla Wafers can be swapped out for 6oz of any cookie or graham cracker. In a food processor, pulse cookies until finely ground (you should have about 1 1/2 cups). Add sugar, salt, and butter and pulse until combined. Heat a large saucepan over low-medium heat. Add the milk and scald. In a separate saucepan, combine the sugar, flour and salt. Gradually stir in the scalded milk. Over medium heat, constantly stirring, cook the milk mixture until thickened. In a small bowl, place the egg yolks and whisk together. Temper the yolks by stirring in a small amount of the hot milk mixture while whisking. When thoroughly combined, slowly stream in the yolks into the hot milk mixture. Cook for one minute longer, stirring constantly and the mixture has really thickened. Remove the saucepan from the heat and blend in the butter and 1 teaspoon vanilla. Allow to sit at room temperature to slightly cool to lukewarm. 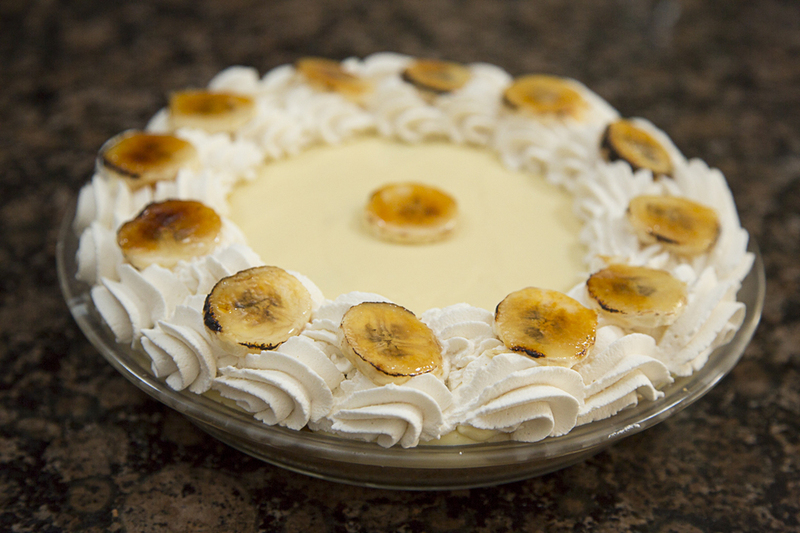 When ready, grab the baked and cooled pie shell and layer the sliced bananas and custard. Alternating between the two, making layers, until all the custard and bananas are used; leaving the last layer custard. Cover the pie with plastic wrap and place in the fridge. Allow to chill for several hours, minimum 1 hour, but longer would be better. In the meantime, make the whipped cream topping. In a bowl of a stand mixer, fitted with the whisk attachment, place the chilled heavy cream. Whip on low for a few seconds, and then raise to medium. When the cream has somewhat thickened, add the sugar and vanilla. Continue whipping until the cream has formed soft peaks. Be careful not to over whip it into butter. Scoop the mixture into a pastry bag and decoratively pipe out the cream onto the chilled pie. Or you can simply spoon the cream over the top. Sprinkle with sliced almonds if desired. Slice and serve. Save any leftover pie in the fridge. Enjoy. 1. Pour chilled whipping cream into a bowl. 2. 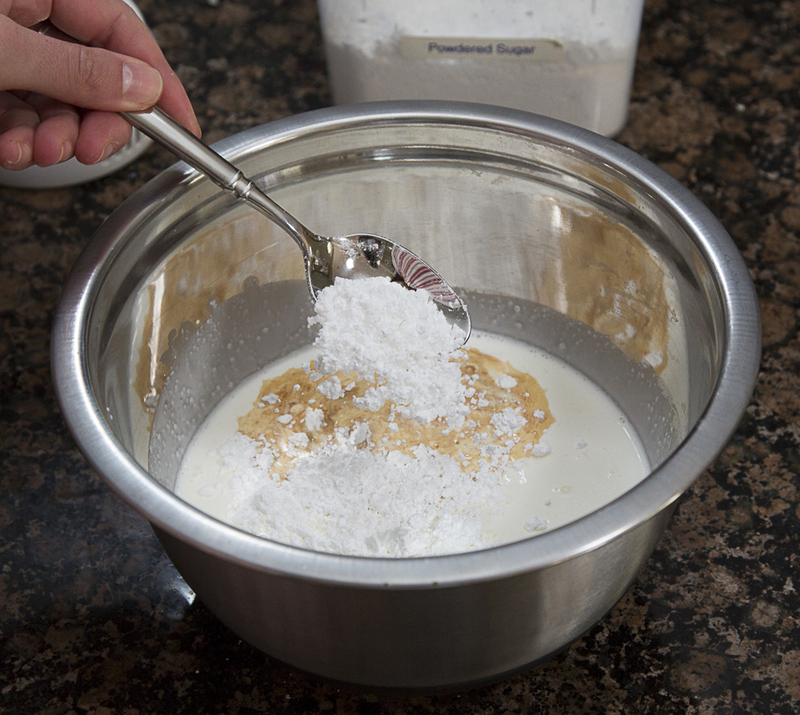 With either a standing or hand mixer on low setting, begin to whip the cream. 3. Pour in a splash of vanilla and heaping spoonful of powdered sugar, to taste. 4. Continue whipping the cream until the desired consistency has been reached. Careful not to over whip! Another layer of bananas...repeat until your pie is filled. The whipped cream can also be simply spread over the top. 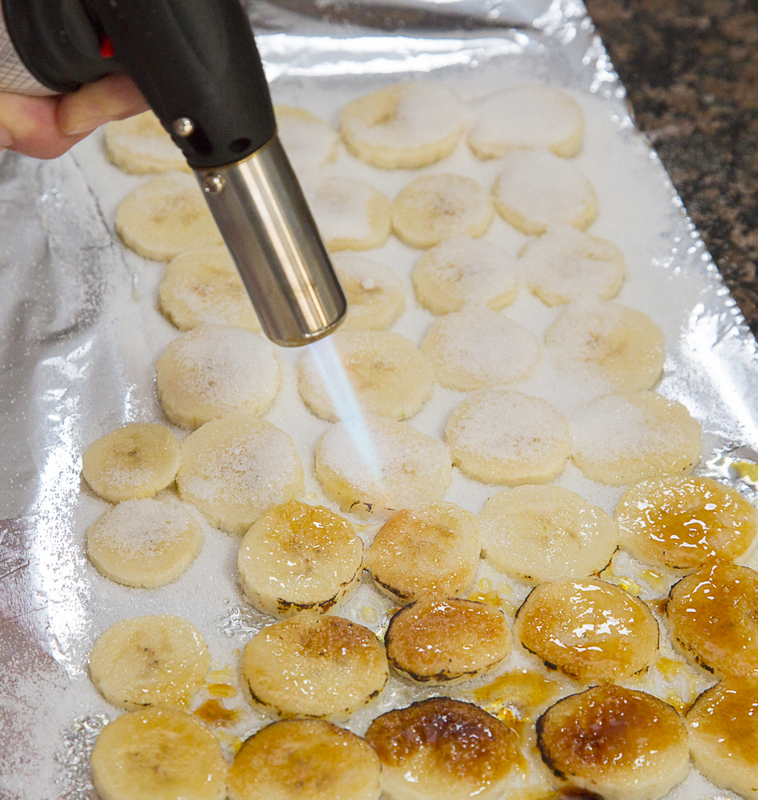 To caramelize the bananas (or just about anything) sprinkle with sugar and take a blow torch to 'em. It's super fun.